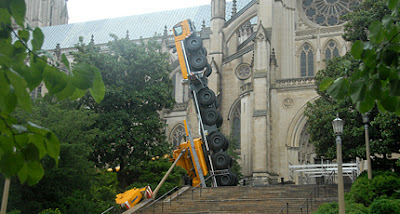 Crane collapsed without warning today at the National Cathedral. A crane toppled at the National Cathedral this morning, sending its operator to the hospital, damaging two out-buildings and crushing four vehicles that belonged to contractors. 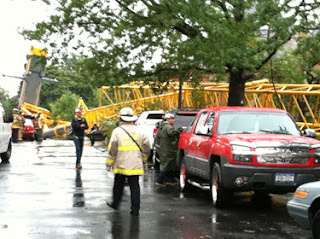 Richard Weinberg, spokesman for the Cathedral, said he understood that the crane operator’s injuries were not serious. He said he was “not at liberty” to name the crane contracting company. The crane was lifting supplies to the top of the cathedral at 3101 Wisconsin Ave. as part of the ongoing earthquake repair when it collapsed without warning at 10:55 a.m.
“We don’t know why it collapsed,” DC Fire/EMS Battalion Chief John Donnelly said. Wind gusts of 40 to 50 mph were reported in the area at the time of accident. The operator was inside the crane when it fell. Weinberg could not confirm whether anyone was in the vehicles that were damaged. Twenty people were in the buildings that sustained damage but none were hurt, he said. The bright yellow crane lay twisted on South Road, which runs along the south side of the cathedral. The road is mostly used by employees and passes by the main office of the Episcopal Diocese of Washington, also known as Church House. The tip of the crane lay in front of Church House. Watch is a video story of the start of repairs before the crane collapsed here.